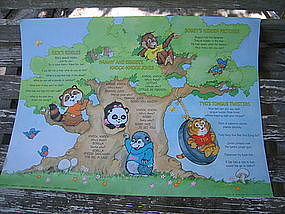 Paper placemat manufactured in 1982 by Hallmark. It measures 16 1/2 x 11 1/2 inches. There are no rips, tears or soiling. I need your zip code to calculate the postage. 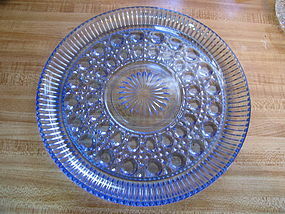 Vintage blue glass plate measuring 11 inches in width. I am assuming it was made to be used as a cake plate, but could have other uses. It has a cane and button design. There is no damage. I have other pieces in this pattern, available for purchase. I need your zip code to calculate the postage. 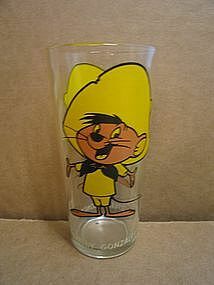 1990 Turner Entertainment Company glass. 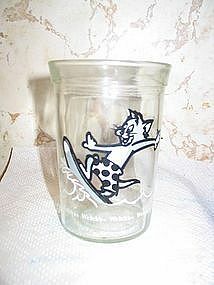 This particular glass is the surfing scene. No damage. Roller skate and skateboard design are also available. I need your zip code to calculate the postage. 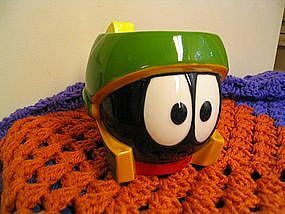 Ceramic mug manufactured by Applause in 1992. No damage, but used as display. I need your zip code to calculate the postage. 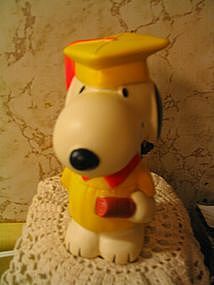 Danara 6 3/8 inches in height graduate plastic bank. Not sure of the exact date of manufacture, but is marked 1958, 1966 United Feature Syndicate. The original stopper is in place. No structural damage and very little loss of the finish, but needs additional cleaning. I will be happy to provide additional photos or answer any questions regarding this bank. I need your zip code to calculate the postage. 1981 plastic figure. 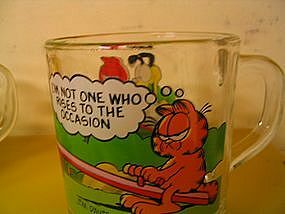 When you push the bottom, Garfield's eyes close. 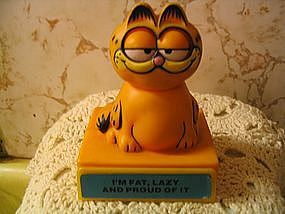 As you can see, "I'm Fat, Lazy And Proud Of It." It is in dire need of cleaning, but fear I would damage the plastic. There are couple of areas on the side that looks like a manufacturing flaw, but it does not cause any structural damage. I will be glad to provide more detailed photos. I need your zip code to calculate the postage. Free shipping on this opened package of 1998 Rugrats Stickers from American Greeting. There are 4 sheets of 10 stickers for a total of 40. Please email for photo or questions. I need your zip code to calculate the postage. 1978 McDonald's issue. Two mugs available and are as follows: 1. Use Your Friends Wisely (There are 2 mugs available with this logo). 2. I'm Easy To Get Along With When Things Go My Way. There is no damage. I have several of the series available and priced at $8.00 per mug. I need your zip code to calculate the postage. 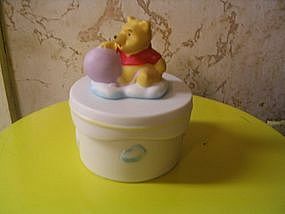 Vintage trinket box manufactured in Japan and marked Disney. Feels like a bisque type material. Approximately 4 1/2" in height and 3 1/4" in width. No damage, but several manufacturing flaws. I need your zip code to calculate the postage. 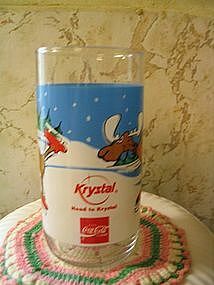 This Krystal Coke glass has no damage. I need your zip code to calculate the postage. 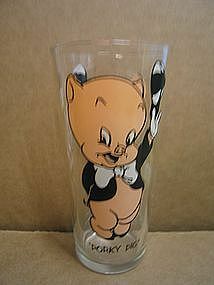 Anchor Hocking 13.5 ounce rocks glass with a 1994 Warner Bros. trademark. 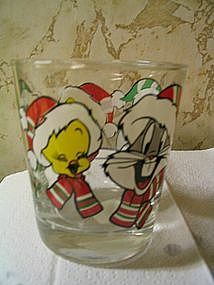 Sylvester, Bugs and Tweety displayed on the glass. Little if any sign of use. Need your zip code for postage calculation. 2 available. 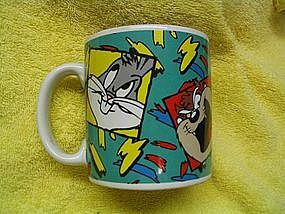 This 1993 ceramic mug features, Bugs, Tweety, Sylvester and Taz. Exterior has no problems but the interior is crazed. I need your zip code to calculate the postage. 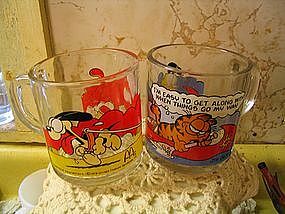 Anchor Hocking 1980 Collectors Series No. 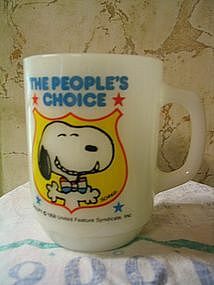 4 Snoopy for President. 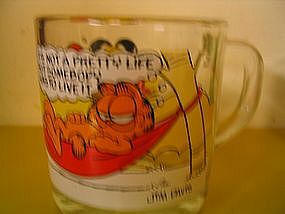 There does not appear to be any damage to this mug. Additional photos by email. I need your zip code to calculate the postage. Manufactured in 1978. It shows some signs of use. 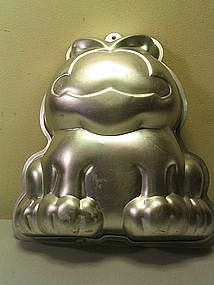 There is supposed to be a small baking pan to complete the details of the face, which is not included. I need your zip code to calculate the postage.